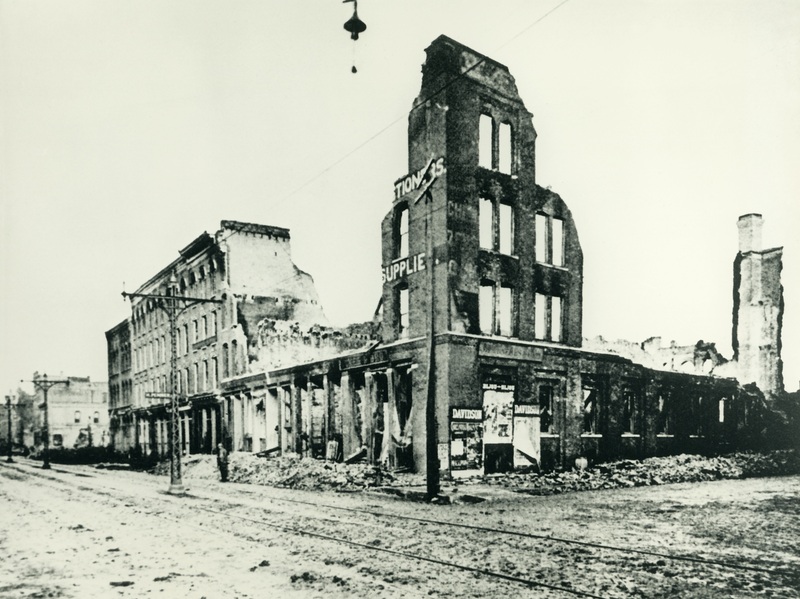 At about 5:40 p.m. on Friday, October 28, 1892, spontaneous combustion in the Union Oil and Paint Company building on the Milwaukee River at Water Street, south of St. Paul Avenue, caused a fire. Strong winds swirling from the west and northwest pushed the fire east to Lake Michigan and south to Erie Street. By midnight, the city’s largest and most destructive fire partially or completely burned out twenty city blocks. More than 440 buildings, mostly small wooden homes, were destroyed. More than 350 families—2,500 people in all, most of them Irish—were left homeless. Another 150 families suffered damage to their residences. Five people died: two firemen and an unknown man were crushed by a collapsing wall, and two women with heart problems succumbed. The fire lit up the sky over the Third Ward and was visible from Waukegan, Illinois to Sheboygan, Wisconsin. So many city residents rushed to see the fire that it was claimed that only invalids, infants, and people in jail missed the sight. Fire departments hurried by train from Chicago, Kenosha, Racine, Sheboygan, and Oshkosh, but they were too late to stop the destruction. The homeless spent the chilly night where they could; the Third Ward School, the Cathedral of St. John the Evangelist, and the old St. Gall’s Church housed hundreds overnight. Some stayed with friends or relatives, and the city’s hotels provided shelter in their vacant rooms. Victims received meal tickets to restaurants and clothing. Donated funds provided expense money for those who required it; many of the displaced were granted an allowance to furnish new dwellings. One relief committee assisted those who lost their jobs due to the destruction of their places of employment. Another committee helped policy owners deal with insurance companies after some attempted to cheat their clients. The post-fire population of the Third Ward never came close to reaching the pre-fire numbers. Only about ten percent of those burned out had fire insurance. Several hundred lost their jobs and lacked the income to rebuild. Even more lost work during the financial Panic of 1893. There was increasing pressure to make new homes fire-resistant by cladding them in brick, which doubled the cost of rebuilding. Business leaders thought that no residences should be built in the Third Ward at all. Because the Ward had excellent water and rail shipping facilities, they argued warehouses would be the best use of the area. So, most residents did not rebuild. Many moved west, to the Irish Tory Hill neighborhood across the river, or farther west to the increasingly Irish community of Merrill Park. The Irish congregation at Holy Rosary church on Oakland Avenue grew dramatically after the fire, as did the numbers at St. Matthew church on 25th and Scott. Others moved nearer employment opportunities in the new industrial suburbs of West Allis, South Milwaukee, and Cudahy. Over the next ten years, Italians replaced the Irish in the Third Ward, but the overall population continued to dwindle for decades. Today, the warehouses have been converted to apartments and condos, and new construction has finally brought the Ward back to the thriving, people-oriented community that it was before the fire. ^ Wayne Mutza, Milwaukee Fire Department (Mount Pleasant, SC: Arcadia Publishing Co., 2005), 19. ^ “Among the Homeless,” Milwaukee Sentinel, October 30, 1892, 5. ^ “Insurance Claims,” Milwaukee Sentinel, November 13, 1892, 7. Milwaukee Journal, October 28-December 31, 1892. Milwaukee Sentinel, October 28-December 31, 1892. Nailen, Richard, and James S. Haight. Beertown Blazes; A Century of Milwaukee Firefighting. Milwaukee: n.p., 1971.